the mass per person of the uranium collector would be 0.5 kg. is 4 kWh/d per person. the energy amplifier could offer 120 kWh/d per person for 60 000 years. Table 24.7. 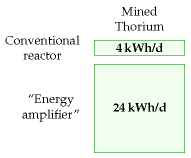 Known world thorium resources in monazite (economically extractable).